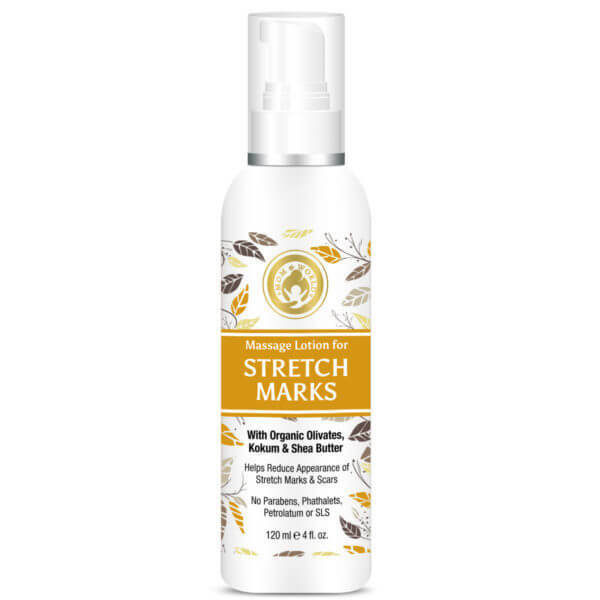 Mom And World Massage Lotion for Stretch Marks has an advanced, multi-action formula that nourishes and repairs the skin by using safe, organic and natural ingredients. It is an ideal choice for women looking to reduce the appearance of stretch marks during and after pregnancy. The special blend of botanical butter in the lotion gives you a soft, smooth and rejuvenated skin. Its essential vitamins enhance skin tone, texture, and brightness and provide wholesome nourishment to your skin. 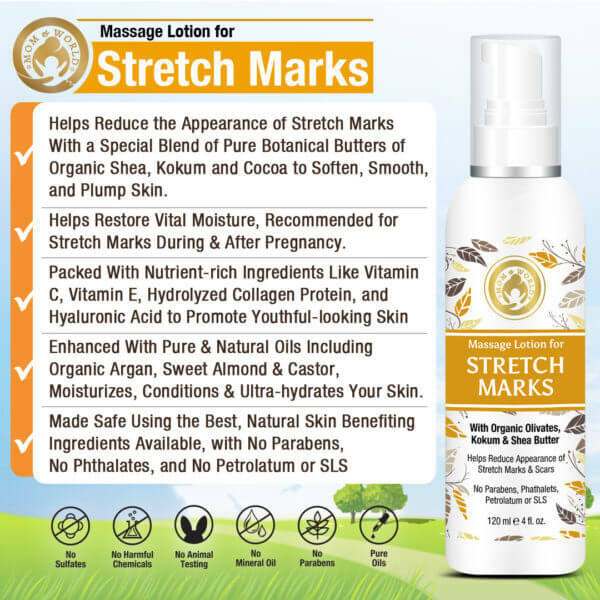 Not just expectant mothers, anyone wishing away the stretch marks that appear as a result of weight gain, puberty, increase in muscle mass, or aging will find this massage lotion useful. 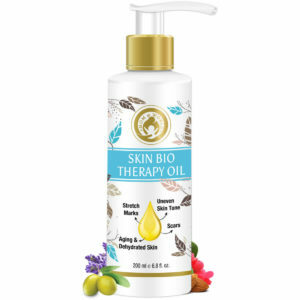 The pure and natural oils keep your skin ultra-hydrated and improve skin elasticity. What Are Stretch Marks and Why Do They Occur? Stretch marks, also called striaegravidarum, are red, purple or silver marks that appear on the belly, thighs, hips or breasts when these body parts expand due to pregnancy, weight gain, obesity, or puberty. Stretch marks usually form in the middle layer of the skin (called dermis) when the tissue is stretched beyond the skin’s natural elasticity. They are a cosmetic concern. Mom And World Massage Lotion for Stretch Marks combines a host of ingredients that have been scientifically proven to benefit the skin. Together, Kokum Butter and Shea Butter work well to give your skin the much-needed nourishment against stretch marks. The incredible Aloe Vera is already a staple of many beauty products. 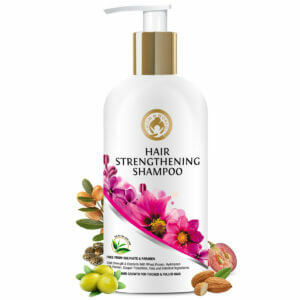 It is rich in vitamins, minerals, enzymes, amino acids, sugars, fatty acids and anthraquinones . 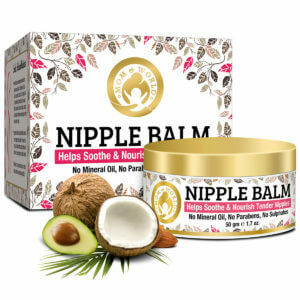 It has been scientifically proven to be an excellent moisturizer , and is known to display a positive tightening and firming action on the skin . Essential Oils are concentrated extracts that retain the natural smell and flavor of their source plant. Mom And World Massage Lotion for Stretch Marks contain four different types of essential oils. Mom and World Massage Lotion for Stretch Marks contain Vitamin C and Vitamin E, both of which have skin nourishing qualities. Collagen is a structural protein found in the skin and connective tissues of all animals, including humans. When collagen is broken into smaller particles that are easy to process, it becomes hydrolyzed. Hydrolyzed Collagen can be consumed orally as a supplement or applied topically. 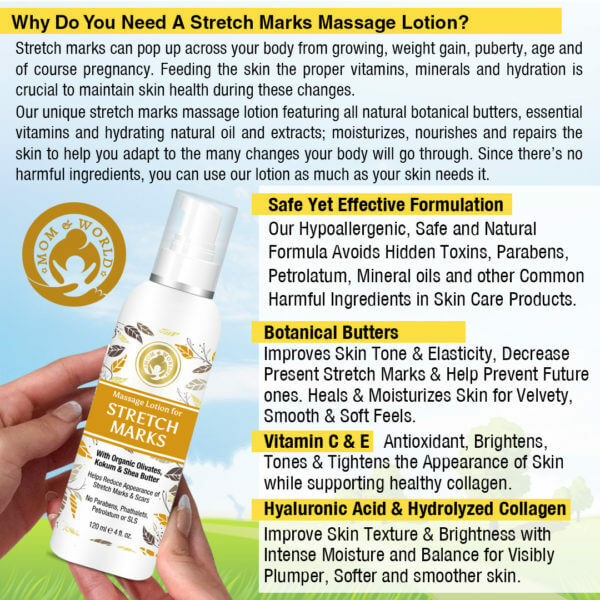 How Safe is Mom And World Massage Lotion for Stretch Marks? This product is safe for all skin types. It is made using the best ingredients available. 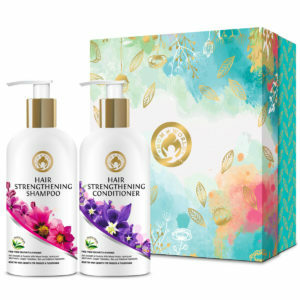 It contains no harmful chemicals, no sulfates, no mineral oil, no parabens, no phthalates, no petrolatum or SLS. Do not use this lotion on damaged or broken skin. In case of contact with the eyes, rinse immediately. 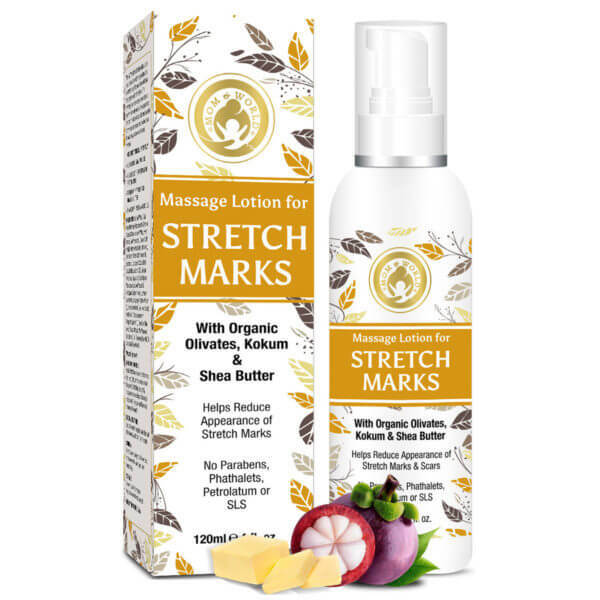 Apply this lotion to abdomen, hips, legs, arms or other areas of the body where stretch marks might appear. Gently massage the lotion into the skin, using circular motion until it is fully absorbed. For best results, use it in the morning and at night. Glycerin, Water, Sweet Almond Cold Pressed Oil, Organic Shea Butter, Castor Cold Pressed Oil, Kokum Butter, Cocoa Butter, Organic Moroccan Argan Cold Pressed Oil, Lavender Essential Oil, Lemon Essential Oil, Lemon Extract, Rosemary Essential Oil, Carrot Seed Essential Oil. With regular use this lotion keeps the skin supple. It is helping in giving the skin a smoother appearance and the stretch marks are slowly fading. This is a non-greasy product. Absorbs rapidly and leaves the skin hydrated. It gives the skin a smoother appearance that is making the stretch marks less noticeable.